Houston is the largest city in Texas and the fourth largest in the United States. It is named after Sam Houston, a General who led troops to victory in the Texas Revolution, and the first president of the Republic of Texas. 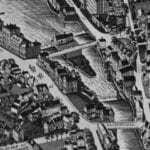 Houston was first colonized in August 1836 by two brothers, John and Augustus Allen. 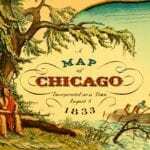 They settled at Allen’s Landing, purchased 6,642 acres and began a colony consisting of twelve residents and one log cabin in 1837. 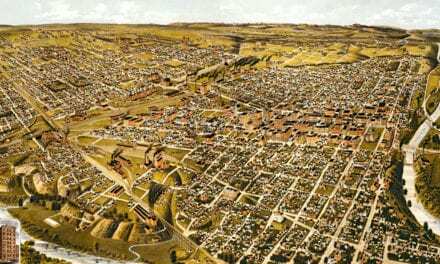 In four months the city grew to 1,500 people and 100 houses. Houston had 400,000 residents by the 1940’s, and reached the million person mark in the 1960’s. Today, more than two million people call Houston home. 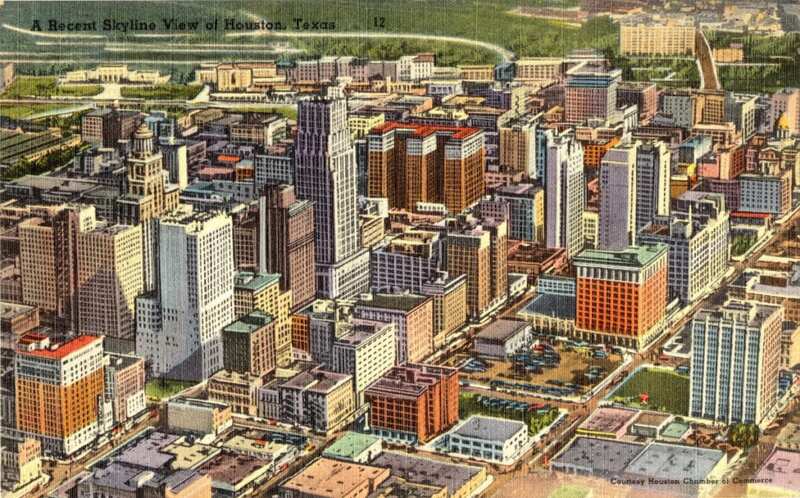 These images from vintage postcards showcase Houston’s remarkable growth between 1940 – 1950, when the city was the fastest growing in the United States. 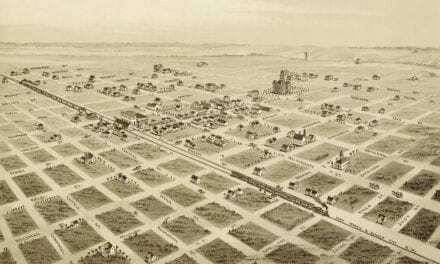 This period of growth transformed Houston into the metropolis it is today. On the left side of the street you can see two historic theaters that were major attractions on Houston’s Main Street, The Metropolitan and the Loew’s State Theatre. 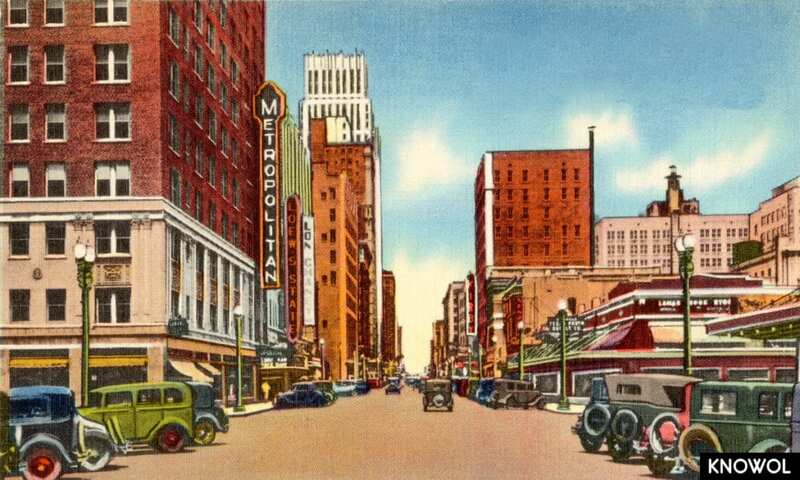 The Metropolitan Theatre, located at 1018 Main Street, was an Egyptian themed Art Deco masterpiece with a sphinx overlooking the walkways and floors decorated with mosaic murals of ancient Egypt. The theatre showed movies as well as hosted live orchestras in the evening. The theater opened in 1926 and was destroyed in 1973. The Loew’s State Theatre was located directly next door and was also constructed by Karl Hoblitzelle, the same man who constructed The Metropolitan. Loew’s State Theatre opened in 1927 and closed in 1972. The theatres of Houston were a major draw during the 1930’s – 1960’s, when numerous glamorous theatres drew huge crowds downtown. The tall building in the distance on the left is the Gulf Building, an Art Deco skyscraper. The building opened in 1929 and held the title of tallest building in Houston until 1963, when the Humble Building surpassed it. It is now the JPMorgan Chase Building, their Houston headquarters. This is the Houston Municipal Airport Terminal building, now known as the 1940 Air Terminal Museum. The terminal was the first air passenger terminal in Houston, built at a time when commercial air travel was starting to become more mainstream. The terminal building was constructed in the art moderne style, and is one of the few remaining examples of an airport terminal in that style of architecture. 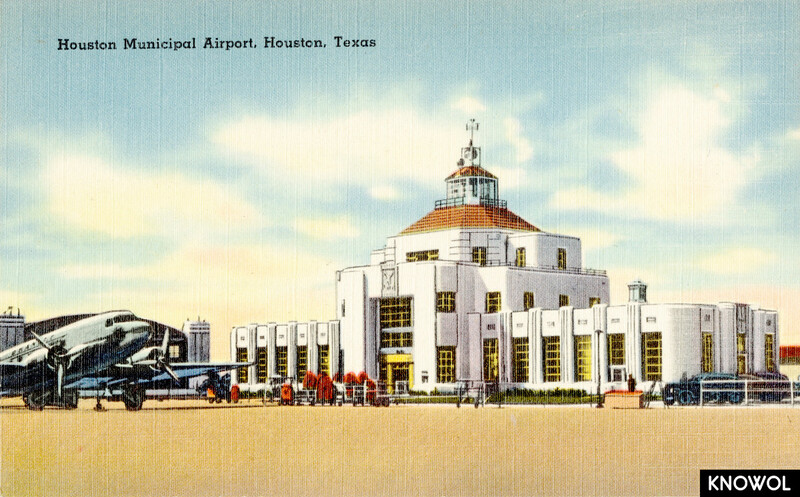 Houston’s Municipal Airport Terminal opened in 1940 and closed in 1978. It then sat empty for 20 years until the Houston Aeronautical Heritage Society worked to turn it into a museum. The museum showcases Houston’s rich aviation history, and is located at present-day William P. Hobby Airport. 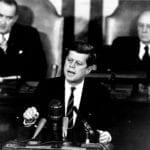 The air field became the Houston International Airport in 1954 and in 1967 was named after a former Texas governor, William P. Hobby. Hobby is Houston’s oldest commercial airport and was its primary commercial airport until Houston Intercontinental Airport, now George Bush Intercontinental Airport, opened in 1969. 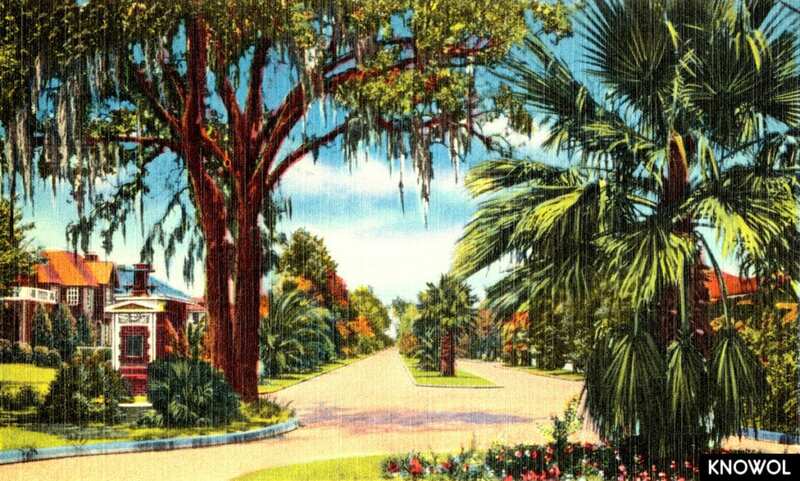 A palm lined street in a Houston neighborhood. After World War II, Houston became one of the fastest growing cities in the United States. The growth was spurred by companies moving to the area to make use of Houston’s waterways. 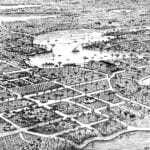 In 1948, the city more than doubled in size by annexing several unincorported areas outside of its original borders. 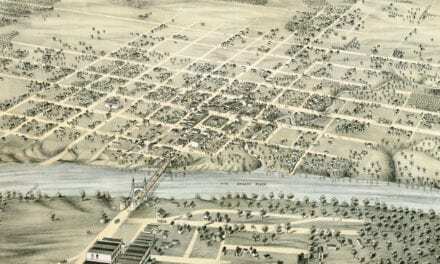 This is one of the reasons Houston is now the most populous city in Texas, with a variety of unique neighborhoods and villages. 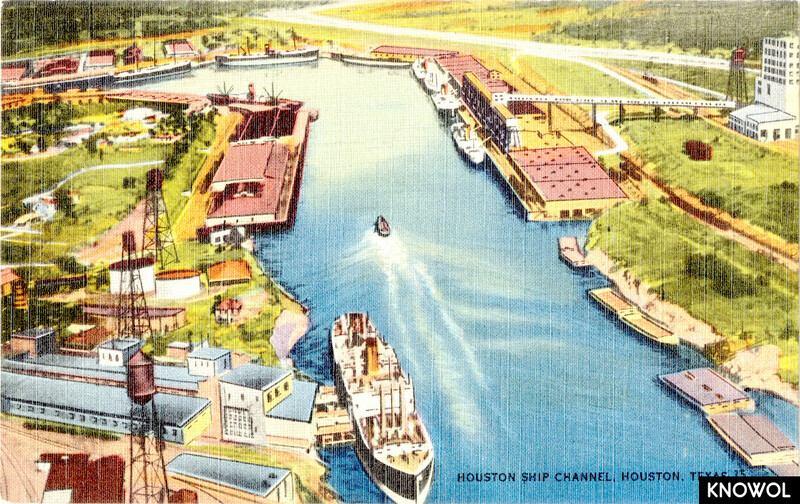 The Houston Ship Channel is one of the United States busiest seaports. 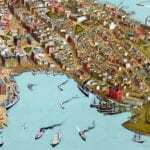 The channel was a naturally occuring waterway that was widened and deepened to allow commercial travel between Houston and the Gulf of Mexico. The channel has been used to transport commercial goods since 1836, and has been the busiest ship channel in Texas since the 1940’s. It is now home of The Bayport Cruise Terminal. 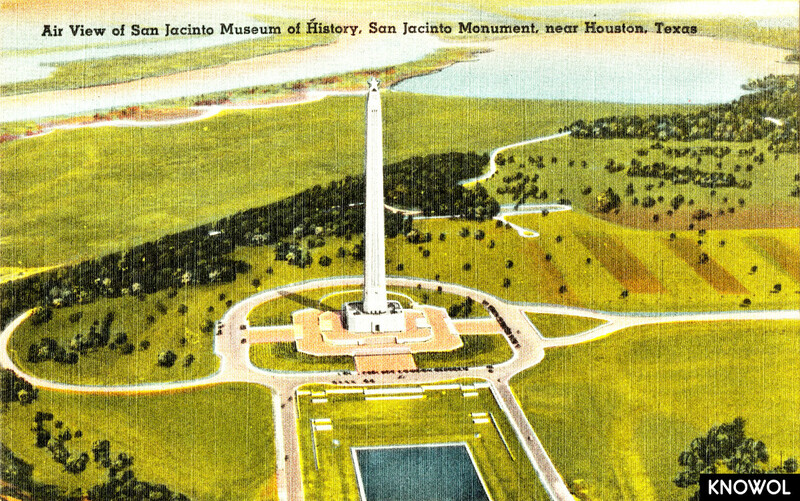 The San Jacinto Monument is located on the Houston Ship Channel, and commemorates the site of the Battle of San Jacinto. The Battle of San Jacinto was the decisive battle of the Texas Revolution, leading to a peace agreement being signed between the colonists in the Mexican province of Texas and the Mexican government. The peace treaty that resulted from The Battle of San Jacinto paved the way for Texas to become its own country, The Republic of Texas. Texas was an independent North American country from March 2, 1836, until February 19, 1846, when it was annexed by the United States. 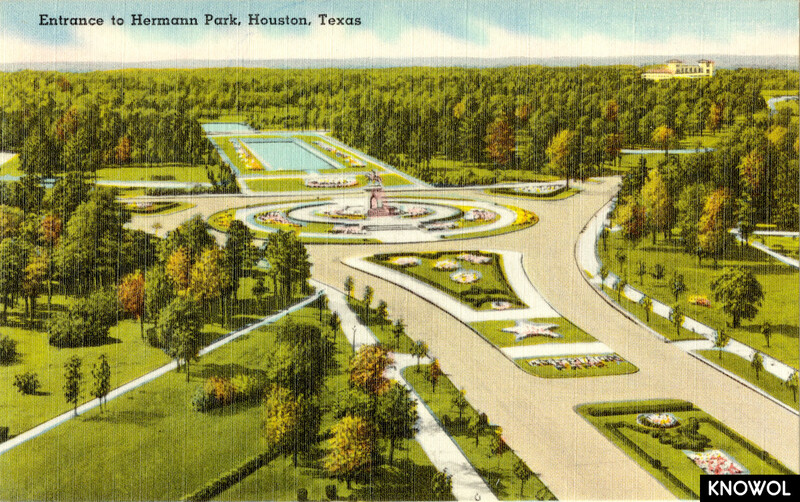 Hermann Park is a historic park that opened in Houston in 1899. Hermann Park home to the Houston Zoo, Houston Museum of Natural Science, Miller Outdoor Theatre and the Hermann Park Golf Course. The entrance to the park was designed by George Kessler, a pioneering city planner and landscape architect. Sam Houston was the Commander-in-Chief of the Texan independence movement and became the twice-elected President of the Republic of Texas. Houston led troops to a decisive victory in the Battle of San Jacinto in only 18 minutes, despite his ankle being shattered by a stray bullet. 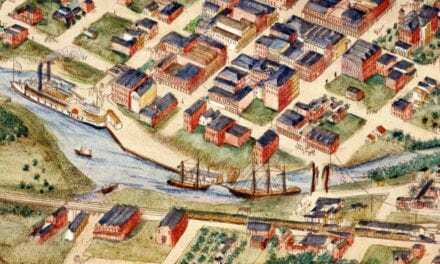 Houston later played a large role in Texas joining the United States and served as a U.S. Senator and governor of the State of Texas. 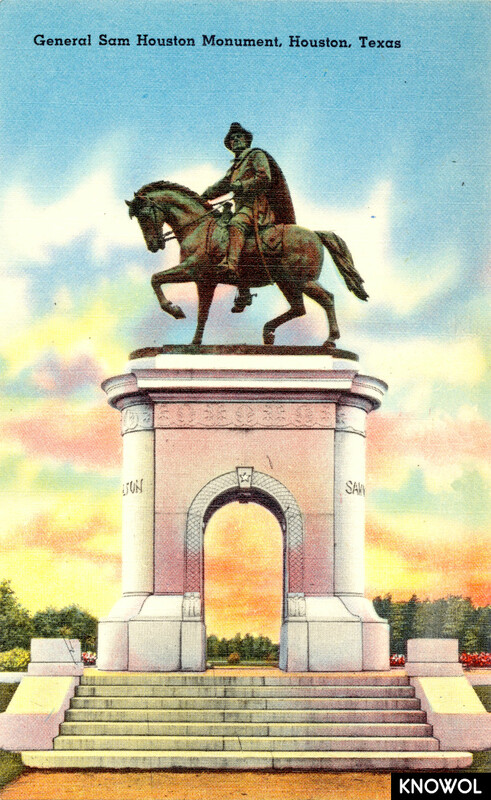 The statue was built in 1925 and is located at the northwest corner of Hermann Park. 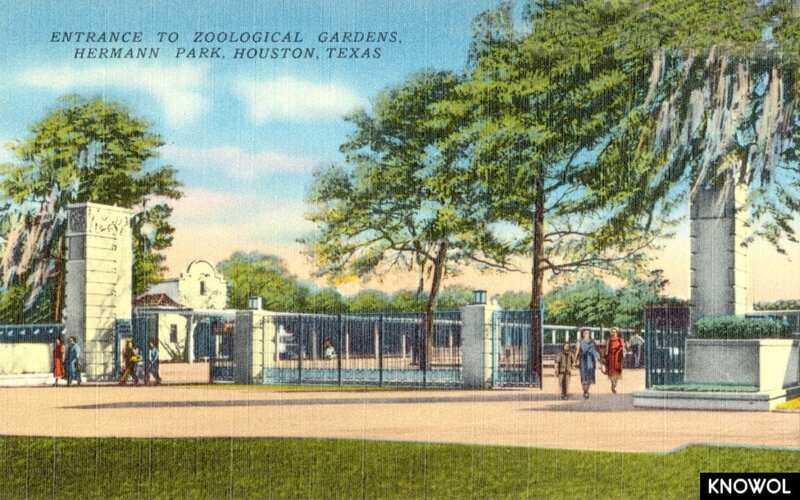 The Houston Zoo is the second most visited zoo in the United States, with more than 2 million guests each year. The zoo was founded in 1922, and now consists of 55 acres and more than 6,000 different animals. 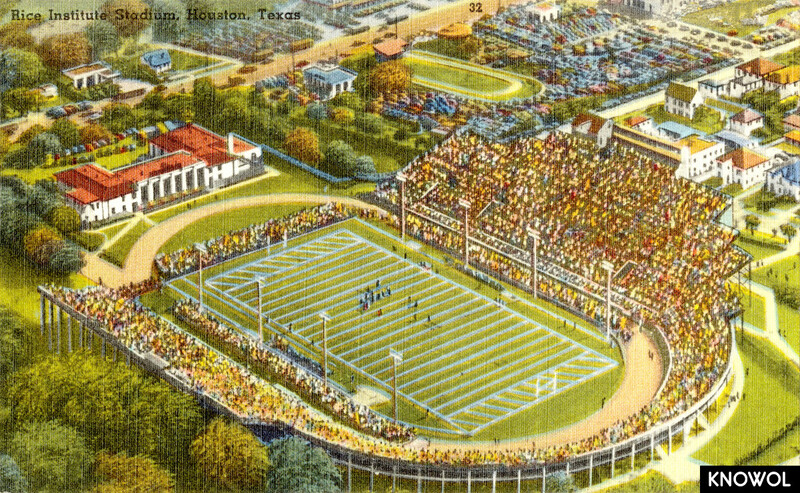 This postcard shows Rice’s football stadium as it looked in the 1940’s. 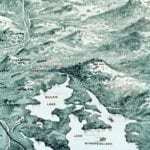 At the time it was simply known as Rice Field. 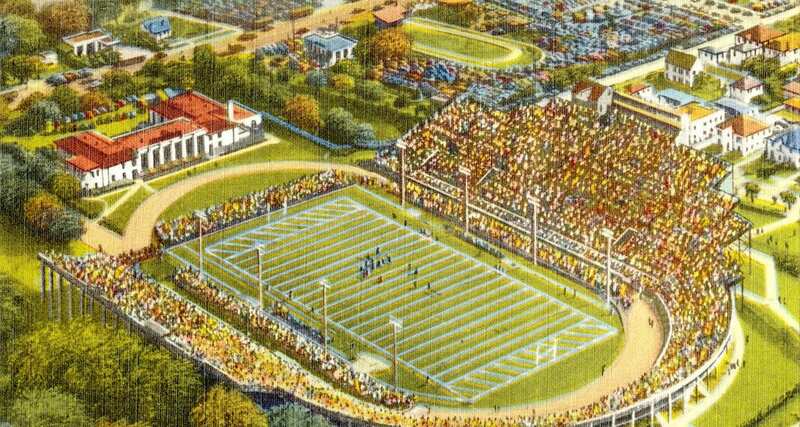 It was replaced as the football stadium in 1950, when Rice Stadium opened. The field still exists, and is now used by Rice’s soccer and track teams. Today, Houston is a diverse city known for its unique culture created by its vibrant international community. 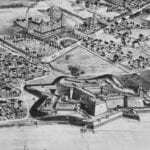 The many districts of Houston each have a unique story to tell, so be sure to sign up for our mailing list if you would like to see more unique historical pictures of Houston, Texas.